Many groups and individuals have long had aspirations for St Giles - to make this marvellous space worthy of the surrounding architecture, and to make it more of a public place and less dominated by space dedicated to traffic. With tentative plans drawn up by Sushila Dhall, and the support of the Oxford Civic Society and Cyclox, we invited Ben Hamilton-Baillie to meet a small group of us to get ideas about how to proceed. We learned that plans were premature, that what is needed first is collection of data to establish current patterns of use by pedestrians, cyclists and vehicles. We need to define what is unsatisfactory about the present layout, both in terms of safety and in its failure to fulfil its potential as a beautiful public place. A group of volunteers has since counted pedestrian and cycle movements in all directions at several points throughout the length of St Giles at different times and days of the week (see below for data tabulated by Keith Frayn). The campaign gained new impetus at our July meeting with the return of Ben to address a larger meeting of representatives from Oxford Civic Society, Cyclox, Sustrans, City and County Councillors and officers, and many individuals, including Ted Dewan of Roadwitch, interested in creating a more beautiful place for people in the heart of our city. Ben's general thesis was that the attractiveness and safety of a city's public realm, the space between and around its buildings, will determine economic survival in the age of on-line and out-of-town shopping. These ideas are shared by our City Centre Manager Gordon Reid, who has exciting ideas about future use of St Giles. City-centre shopping, cultural, and tourist attractions are important economic and social activities but will not survive well without a revolution in assumptions about traffic in city streets. In particular, the relationship between vehicles and other users - and uses - of city streets has to be re-examined. The Buchanan report of the 1960s recommended segregation of pedestrians from vehicular traffic, which has led to unattractive urban centres and increasing dominance of motorised traffic. Transport planners are now re-examining this question. The recent DfT Manual for Streets 2 promotes greater integration, and removal of unnecessary lights and signs, reduction of traffic speeds, and more sharing and reallocation of space are as ways of enhancing the experience of residents and visitors in our city streets. 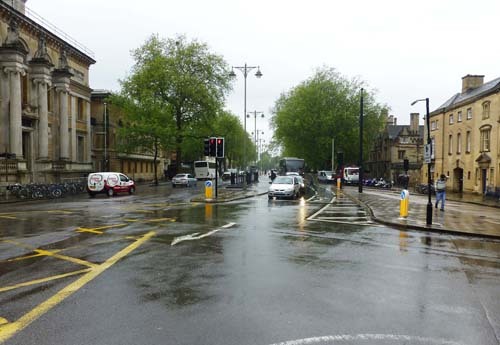 Examples such as Poynton, Exhibition Road and examples from abroad were shown to illustrate these ideas, and a sketch of the Beaumont/Walton Street junction revealed the potential benefit for Oxford. Ben believes speeds of around 17mph are crucial to successful integration and that good design and application of behavioural psychology are better ways of reducing speeds than formal speed limits. New York City's experiment with cheap temporary materials to reduce vehicle dominance may be applicable to St Giles. Strong visionary political leadership will be essential if this project is to succeed. The main point to come out of our survey work was the enormous volume of pedestrian traffic using St Giles. On a Tuesday afternoon, between 4:15 and 5:15 pm, we counted 736 pedestrians walking northwards, 894 southwards (for cyclists the numbers were 246 and 357). There are also a lot of people crossing (166 over the same period) despite the difficulty of getting across two lanes of traffic in each direction. We didn’t make an accurate count of vehicles but from the County Council’s automatic traffic counters on nearby roads, there are likely to be considerably fewer than non-car users. Bus movements at the southern (Martyrs’ Memorial) end are complex, with buses and coaches taking almost every possible combination of directions. Almost all the south-bound car traffic, in contrast, makes a right turn into Beaumont Street, leading to queues (and hence air pollution) at those traffic lights. On Sunday June 7th 2015 at lunchtime we conducted a "snapshot survey" in which we tried to count the number of people in St Giles at any one moment (rather than the flow of people). The results were clear; at any one instant, on a summer Sunday, there were on average 202 people on foot, 14 on cycles, and 75 in vehicles. These results confirm what we have been saying; St Giles is a street predominantly used by pedestrians. For a fuller account of OxPA's St Giles survey work see the slides of Keith Frayn's presentation to the meeting convened by OxPA, the Civic Society, and Cyclox on October 1st 2015.